I went sledding in Danehy Park in Cambridge recently, with my brother and some friends (including Mike, one of the other Boston-area people with a ball pit). The snow was packed, icy, and awfully slick, and we were wondering just how fast the sleds were going at the bottom. This formula tells you that if your car nosedives off a 50-meter bridge (about double eastern US treetop height) you’ll be going about 30 m/s (interstate speed) when you hit the ground, making the crash the equivalent of hitting a concrete wall at highway speed. It also tells you that if a (purely gravity-based) roller coaster’s highest cumulative drop, top to bottom, is 35 m (a typical large coaster), it can’t go faster than 26 m/s (which is roughly the old speed limit of US interstates). Checking with our handy table, we see that 15 m/s is faster than the fastest sprinter, about the speed of a cat or rabbit (but — critically — slightly slower than a raptor), and not near highway speed. We got the GPS from the car and did a few runs with it, recording the maximum speed each time. It was a pretty reliable 10 m/s (11 if we pushed), which is a lot faster than running speed for everyone except Usain Bolt. So, in every state except Wyoming, North Dakota, South Dakota, and Maine, there is a building high enough that Marty McFly could have taken the innards of his DeLorean up a freight elevator and acheived the required 88 mph (40 m/s) by jumping off the roof. (Because of air resistance, I wouldn’t try it in NH/MT/ID/WV/AK/VT, either.) He just needs to leave a note at the bottom explaining that in 30 years they should set out a trampoline. Edit: Sorry for the brief downtime today. 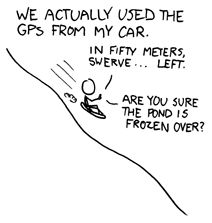 Also, to everyone posting that the GPS will only give horizontal speed and will underestimate speed on the slope: the sled reaches top speed near the bottom. It only starts to decellerate when the grade of the slope is less than the sled’s coefficient of friction (plus a bit for air resistance), which seems to be less than 0.10 (people have trouble eyeballing slope grades, which are almost always shallower than you’d guess). Since sin(x) ~= x for small x, this correction (1/cos(grade)) comes out to at most a percent or two in reality. However, if the fastest part of the slope looked like the one in the second drawing, it would indeed be a big correction.